Your boss wants to talk to you, and pulls out a cell phone to retrieve a map of your location. The idea of someone -- especially your boss -- knowing where you are at the push of a button sounds dreadful, right? Not to a certain German company. 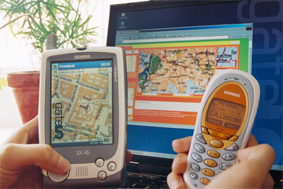 Gate5, a software developer in Berlin, is selling its "People Finder" program to wireless carriers, which lets users of handheld devices pull up maps with the location of other cell-phone users. People must opt into the program, which works on handsets and personal digital assistants with short messaging and e-mail capabilities, the company said. Once a person is located, the two cell-phone users can chat on their phones in real-time -- an application the company expects to become popular. However, what Gate5 doesn't mention in its latest news release is that it's gotten in trouble in the past with privacy advocates for promoting similar products. About six months ago, Gate5 demonstrated on its website software that deciphered whether mobile phones were switched on or off without informing the subscribers who were being monitored. Public response to the demo overwhelmed the company's servers, forcing the company to take it down.